Three weeks later returning to the capital, I meet the group Kel Air Tawangal in the courtyard of an old defunct NGO. It’s vaguely Spanish building, walls of flaking pink stucco and flower-bearing ivy dangling from a trellis. They’re all coffee vendors, and their work kits, portable wooden trays filled with coffee packets, cigarettes, and candy, are stacked against the wall, ready to go at a moment’s notice. Badji and his friends are Wodaabe from the region of Ingall; their guitarist and “chef d’orchestre”, Abdourhamane, is a Tuareg from Agadez. Their music is an attempt to integrate Wodaabe songs and Tuareg pop (though not the first: see Etran Finatawa), fusing the polyphonic call and response vocals with the quintessential electric Tuareg guitar. The crew paints their faces with opaque yellow, the ornate clothing and accentuating ceremonial makeup signature of the Wodaabe. It’s visually striking, the style popularized in the West in Herzog’s film (I speak to a few Wodaabe who have seen it and have some interesting comments) and the photos of Carol Beckwith. Every ethnic group across the swath of West Africa has a highly stylized cultural expression. It’s the cultural or social phenotype, the stuff of stereotypes, assumptions, and that lend themselves to exotic portrayals of people as colorful portraits in the glossy pages of a National Geographic (or Vice Magazine). If the Wodaabe have been defined by a portrayal, both here in Niger and abroad, it is this, the participants dressed and painted to accentuate the whites of the eyes, the teeth, and a thin body form. But Niamey is far from Ingall. Listening to a band from Wodaabe sing the high lonesome songs of the Air in the concrete slums of Niamey is jarring, the context is slightly wrong. Badji and his group are out of place, like most of the Northerners displaced by economics and drawn to the city. If there is a more fitting story of the Wodaabe in Niamey though, it’s the turban and khaki vest, an army of young men who haunt the bus stations and the market streets, peddling candy and cigarettes and making coffee under the streetlights. 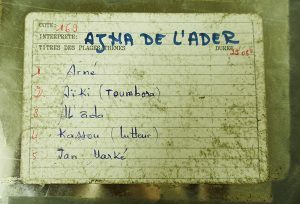 Abdourhamane switches on his amplifier and Mohamed plays half of a calabash suspended in a bucket of water for this driving low thump. The coffee vendors clap and jump, their voices droning in and out of a single harmonic. Their last song is a song about Agadez, and at the end, one by one they turn and hop away until I can no longer hear their voices. 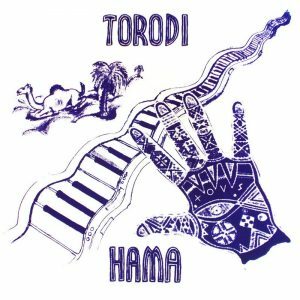 This is amazing music-I love the Tuareg guitar style- the previous post here of Amanar. Its hot and humid here in Toronto ( 30 C ) and the music fits perfectly. Cellphones! How damn lucky I am to get to hear music that in the old days I would have to travel incredible distances to hear live. Loving the music and stories, keep up the good work!